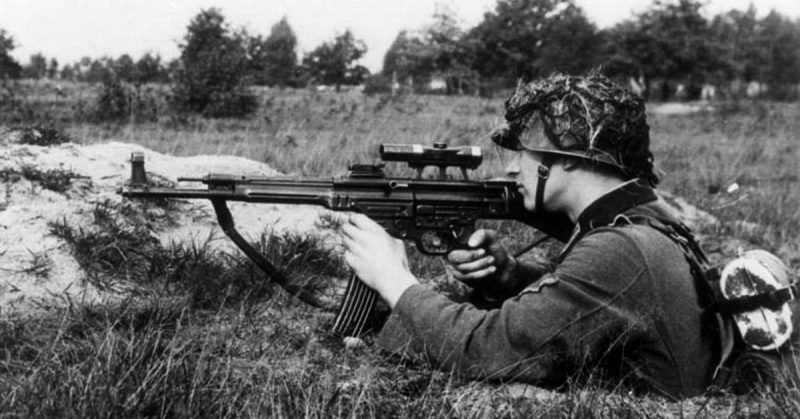 Literally named the “Storm Rifle” and approved by Adolf Hitler himself, the Sturmgewehr 44 was created to address the pressing German need for a medium-range machine gun on the Eastern Front. Often translated into English less literally as “Assault Rifle,” it was the first successful rifle in its class, and inspired following generations of assault rifles. By the middle of World War II the Nazis realized that their main infantry armaments, the 98k Mauser Carbine and MP series submachine guns, were not suitable for fighting on the Eastern Front. While the 98k was effective at long range, it was not especially useful in close range urban combat, and its low rate of fire was a huge limitation in the face of large numbers of Soviet infantry. The MP submachine guns were great at unleashing a hail of bullets, but their 9mm rounds were not very powerful, and the guns’ range was limited. 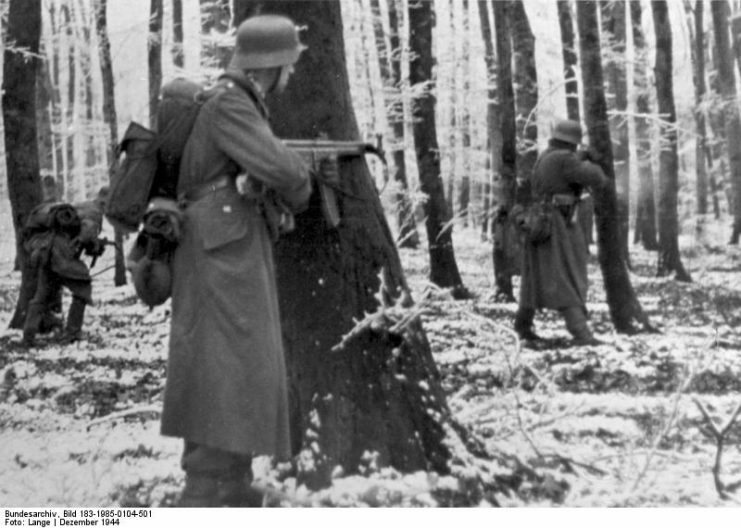 The Nazis realized they need a gun with a rate of fire sufficient to take out waves of infantry, but also with the range and stopping power to fight in the often flat terrain of the western Soviet Union. Initial designs ran into several problems, one of the most notable being that the designers tried to use the 7.92×57mm rounds used in the Mouser. These were too powerful for accurate automatic fire. Eventually, they settled on using the smaller 7.92×33mm Kurz rounds and selective fire. However, this led to debate within Nazi leadership as to whether these rounds were acceptable, with Hitler opposed. In a fit of frustration, Hitler ordered all new rifle development to cease. 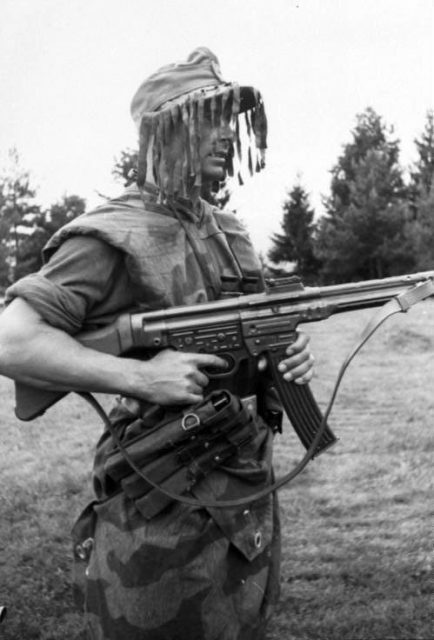 A German infantryman armed with an StG 44, wearing “splinter” camouflage and a ghillie cap in 1944. The developers of the new gun decided to continue development anyway, and tried to get around Hitler’s ban by claiming it was an “upgrade” to existing guns, not a new gun. The chief designer, Hugo Schmeisser, designated this “upgrade” the MP43. Hitler was eventually presented with a new and improved weapon, and as a result he allowed development to continue. Although few MP43s were distributed at this point, they sufficiently impressed Nazi leadership that in April 1944 the program was expanded, and a new slightly upgraded version was designated the MP44. In July, with generals demanding more of these impressive new rifles, the weapon was ordered into mass production. 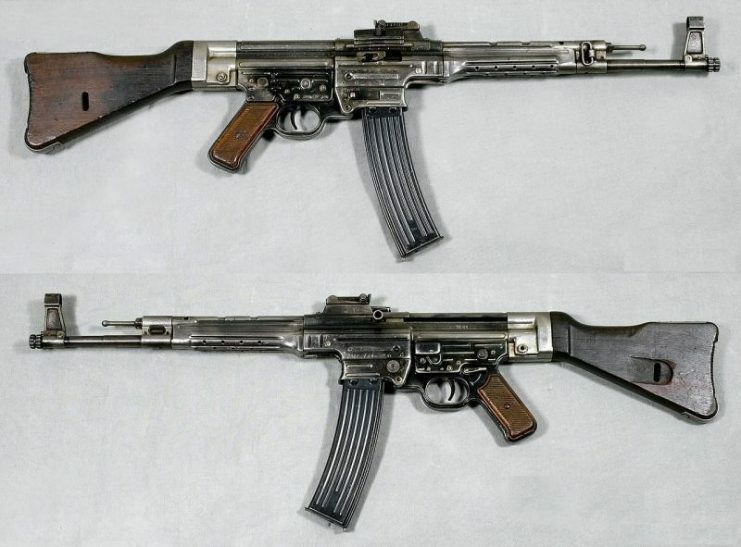 It was once again renamed, this time as the Sturmgewehr 44 “Storm Rifle”, for propaganda purposes. The weapon used a 30-round detachable magazine, had a cyclic rate of fire of 500 rounds per minute, and used a gas-operated action. Its automatic fire was devastating under 330 yards (300m) and its effective semi-automatic range was up to 660 yards (600m). Ultimately, over 425,000 of these assault rifles were produced before the end of the war. In combat, they were well regarded by both soldiers and officers. The first productions were sent directly to SS and Wehrmacht divisions. When Hitler asked his generals what they needed to win the war, one of them reportedly explained “More of those new rifles!” in reference to the StG 44. The weapon revolutionized German fighting capabilities by placing tremendous firepower in the hands of individual soldiers, while retaining accuracy and mobility. However, British and American assessments of the weapon differed drastically. The American military report Tactical and Technical Trends generally spoke poorly of the weapon, noting that it was designed cheaply. The Americans compared it negatively to the M1 Carbine, particularly because the StG was prone to jamming and bending due to its construction. It should be acknowledged that the American report also served a propaganda purpose and overstated the flaws of the weapon in several ways, such as stating that its flaws were so severe that the automatic fire feature was “ineffectual for all practical purposes”. The legacy of the StG, despite whatever flaws it might have had, can not be denied. 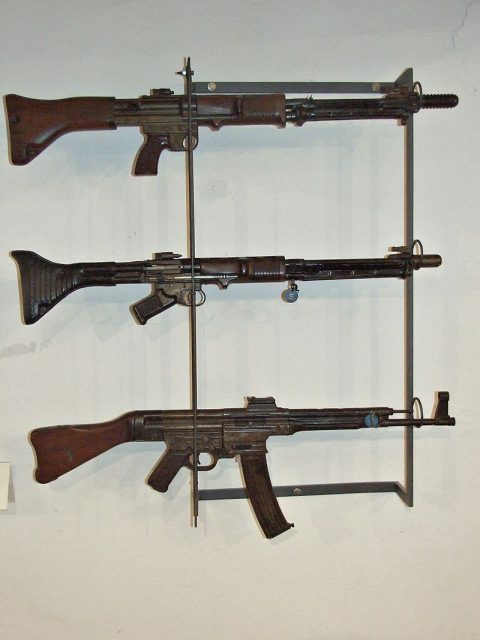 Weapons from the AK-47, to the MP5, to the AR-15 (along with nearly every other modern semi-automatic rifle) have taken inspiration from the StG 44. 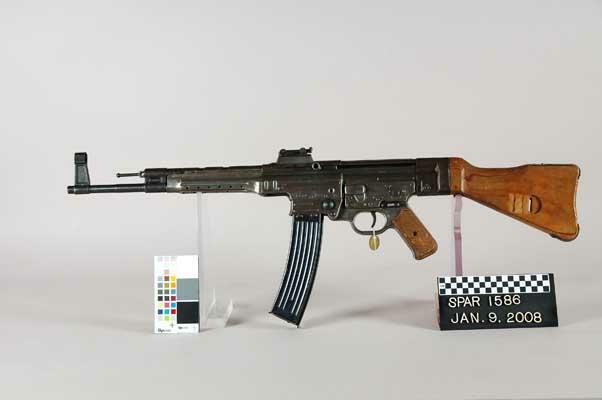 Later assault rifles ironed out many of the flaws found the StG 44, and became the mainstay of all modern militaries. Today the StG 44 is quite popular among collectors, although it is also very rare and expensive. Hill & Mac currently makes reproductions, which they sell for $1,800. Originals are known to go for tens of thousands of dollars. See the below video for a demonstration of both the semi-automatic and full-automatic modes on an earlier MP-43 version of the gun.